Trapped is one of those books I have been waiting to get my hands on for ages and I wasn't even sure if it was coming to the UK when one arrived at my house unexpectedly this week. 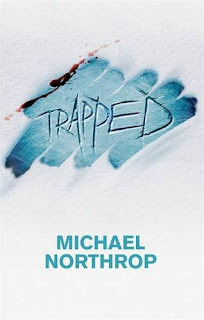 The best thing about trapped is the feeling of sheer clausaphobia you get when reading it. The story is the one of 7 teenagers who find themselves trapped at their school in a horrific snow storm and follows them as they find ways to survive the ordeal. As the story goes on you can see how difficult it is from them to live in such a confinded environment deaaling with the conditions they are faced with. I liked that with such a small cast of characters that you started to get to know some of them really well especially Scott who narrated the books. For me however I think I was expected a bit more to happen in Michael Grant 'Gone' style especially as the press release compared it to Lord of the flies. I found that the characters just accepted their lot a little bit too easily and just sat around waiting for someone to rescue them. Don't get me wrong there were exciting moments but not really enough to make this a wow novel for me. I thought there would be a bit of murder in there! Very disappointed, no murders, but thought it was a fab read.